Six weeks after the horrific ferry accident in South Korea that killed 300 people, and following two failed attempts to find a new prime minister, president Park Geun-hye (박근혜) has decided to retain Chung Hong-won (정홍원) after all. 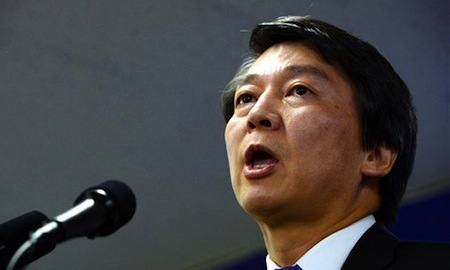 Chung (pictured above) previously announced his resignation as prime minister on April 27, taking responsibility for the government’s performance in the aftermath of the Sewol ferry disaster, with the intention of stepping down as soon as Park could appoint a successor. But along the way, Park ran into trouble. Her first nominee, Ahn Dae-hee (안대희), a longtime state prosecutor and a former South Korean supreme court justice appointed by the late former president Roh Moo-hyun in 2006, was nominated on May 22. 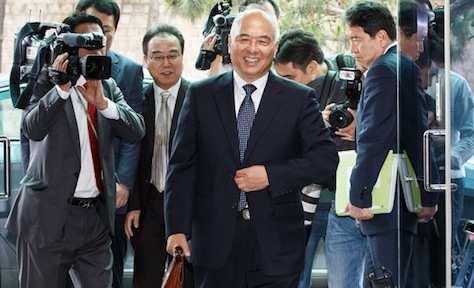 But Ahn (pictured above) withdrew a week later on ethics concerns over the massive amount of money he earned in the months after leaving the supreme court. Her second nominee, Moon Chang-keuk (문창극), a former journalist and former editor of Joongang Daily, withdrew from consideration on June 24, after making comments at a church that Japanese colonization of Korea between 1910 and 1945 was God’s will, something of a controversial statement where Korean-Japan relations in the early 20th century still cause tensions. It didn’t help that many South Koreans felt Moon (pictured above) was unqualified to be prime minister, nor that Moon had often expressed nostalgic admiration for the regime of Park’s authoritarian father, Park Chung-hee (박정희), who ruled South Korea from 1961 to 1979. 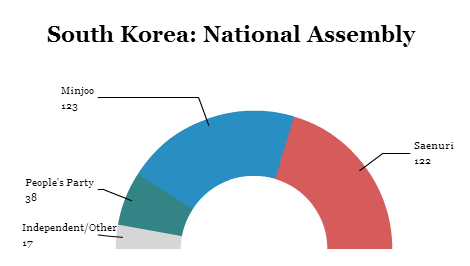 Neither candidate even made it to a vote in the National Assembly (대한민국 국회). Conservative Park Geun-hye (박근혜), the daughter of Park Chun-hee (박정희), the authoritarian leader of South Korea in the 1960s and 1970s widely credited with engineering Korea’s economic growth, was inaugurated on Tuesday as South Korea’s first female president following a convincing victory in the December 2012 presidential election over liberal candidate Moon Jae-in (문재인). Referencing her father’s astoundingly successful economic program, Park also called for a ‘2nd miracle on the Han River’ — Park promised to preside over a happier Korea after a shaking transition period that saw her first choice for prime minister withdraw over a real estate scandal. Park herself has already met sharp criticism over her own apparent backtracking on her campaign commitment to address economic democratization — essentially, income inequality issues in South Korea. 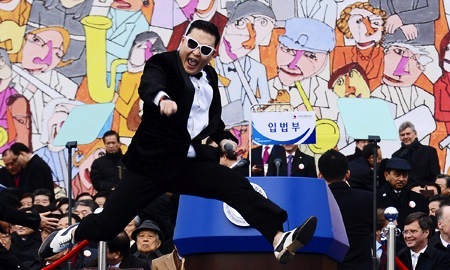 For one day, though, it seems that a happier Korea began with a performance by Psy, who kicked off a decidedly much less somber start to the Park era. She’d rebranded her party from the Grand National Party into the ‘New Frontier’ Party. 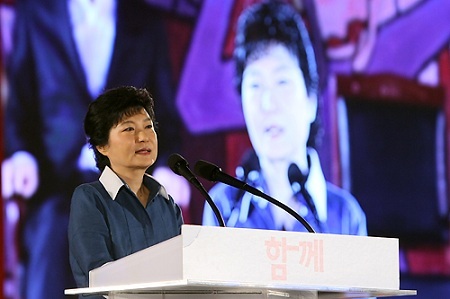 She then led the Saenuri Party to victory in elections for the National Assembly in April despite the unpopularity of her party’s incumbent president Lee Myung-bak (이명박). Even six months ago, she had already co-opted the message of the center-left on ‘economic democratization,’ chaebol reform and income inequality. South Korea’s progressive opposition was largely divided. Mixed feelings (including some nostalgia among older voters) about her father’s authoritarian reign from 1961 to 1979 largely neutralized potentially controversial family ties. By the time South Koreans went to the polls yesterday, all of those factors contributed to her victory. She has defeated Moon Jae-in (문재인) of the Democratic United Party (민주통합당, or the ‘Minju Tonghap-dang’) with 51.6% of the vote to just 47.9% for Moon, ending what was always a very close race — albeit one where Park always seems to hold a slight edge. As we look ahead, all of those factors should equally inform us as to what to expect from Park — the first woman to become South Korea’s president — and her incoming administration. By rebranding her party as the ‘New Frontier’ Party — and making clear that the new frontier would not include Lee (who narrowly defeated Park for her party’s presidential nomination in 2007) — and then running against Lee’s record as much as against her opponent, she neutralized one of the most significant impediments to her candidacy. She reinforced the split during the spring legislative campaign — and, by the way, she’ll enter the Blue House with a very friendly parliament as well. Moon, had he won the election, would have been hampered by a hostile Saenuri majority, but Park will find a largely pliant National Assembly — Saenuri legislators know that they would not have that majority without Park. So she’ll wield significant power as president in order to push through her campaign agenda. That agenda, frankly, does not appear dissimilar to the agenda Moon promised. While the policy details have been less than detailed, Park’s campaign emphasized traditionally liberal themes, and that moderate agenda certainly helped elect Park yesterday. If Park wants to avoid the unpopularity of her predecessor, she’ll have to produce legislative accomplishments, not only on chaebol reform, but also find a way to reduce Korean income inequality and, ultimately, she’ll probably need to be lucky enough to have robust GDP growth. On North Korea, too, both candidates agreed that the next president should be more conciliatory to North Korea than Lee’s administration, but they shied away from advocating a full return to the ‘Sunshine Policy’ of the late 1990s and 2000s that increasingly seemed to South Koreans like a series of handouts in exchange for further aggression from North Korea. So under Park, South Korea will likely retain its firm approach to North Korea, but with relatively more carrots than sticks. In terms of the geopolitics of East Asia, Park — who assumed the role of first lady during her father’s administration at age 22 when, in 1974, her mother was assassinated by North Koreans — will certainly be no shrinking violet (get set for five years of hearing the phrase ‘the Iron Lady of Asia’). South Koreans voters are now at the polls to determine whether conservative Park Geun-hye (박근혜) of the Saenuri Party (새누리당 or the ‘Saenuri-dang’, the New Frontier Party), the daughter of former South Korean leader Park Chung-hee or progressive Moon Jae-in (문재인) of the Democratic United Party (민주통합당, or the ‘Minju Tonghap-dang’), the chief of staff to former president Roh Moo-hyun – will be its next president. Turnout is reported to be running high, and we should know the next Korean president by noon ET. 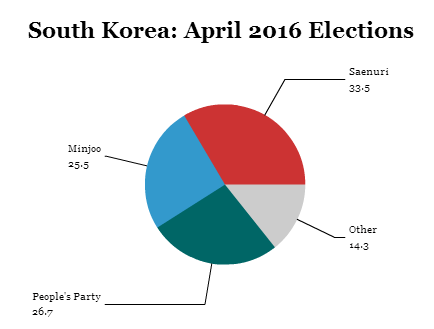 In the meanwhile, be sure to read Suffragio‘s coverage of the South Korean election here. 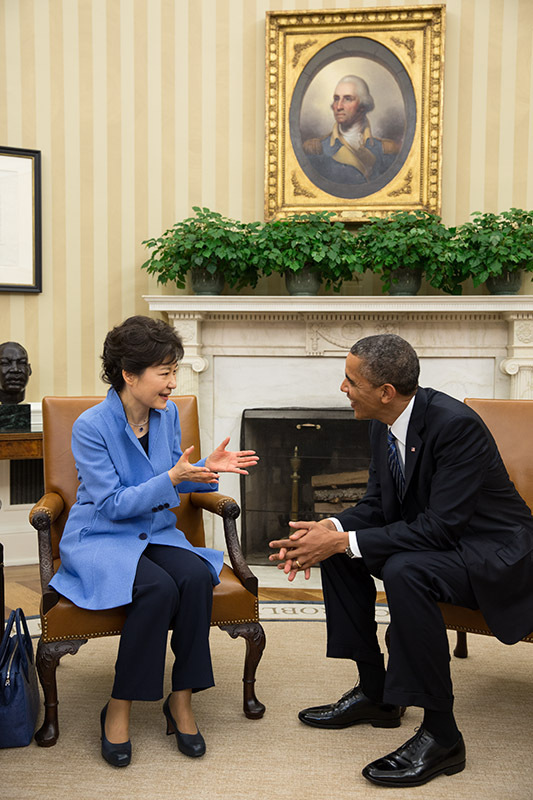 For South Korean economic policymakers, their worst nightmare lies just 400 miles away. After essentially four decades of massive growth (except for a blip following the 1997 Asian financial crisis), South Koreans worry that their hard-charging economy, which has propelled South Korea into the developed world, could end up like Japan’s — stuck in a lost decade (or two) of nearly zero-growth malaise. While Shinzō Abe (安倍 晋三) will return as prime minister in an attempt to kickstart Japan’s economy with massive amounts of public spending after Sunday’s parliamentary elections in Japan, tomorrow’s South Korean presidential election has focused on economic issues that involving avoiding many of the mistakes that Japan made in the 1980s, with South Korean growth already slowing (it may be around 2% or 3% in 2012, historically very low for the Korean economy). In particular, Japan’s economy in the 1980s relied heavily on keiretsu companies — the internationally known champions subsidized and coddled by the Japanese government. South Korea, likewise, features many similar large government-championed conglomerates, known as chaebol in Korean. The chaebol, chief among them globally recognized companies such as LG, Hyundai and Samsung, are highly centralized and still controlled in large part by the families that founded them in the mid-20th century. The chaebol touch almost every aspect of South Korean life. In the morning, Samsung Electronics salesperson Ellen Jeon leaves her home in Tower Palace, a complex in Seoul’s Gangnam district built by Samsung C&T Corp. She crosses the lobby to Starbucks, a franchise owned by a unit of retailer Shinsegae Group that’s run by Samsung Chairman Lee Kun Hee’s nephew. Wearing Tory Burch flats, bought at a Shinsegae department store, she carries her caramel macchiato to her Renault Samsung Motors SM5 sedan to drive to work. Near her home is the Samsung Medical Center, where she bore her first son, a year after her wedding at the five-star Shilla Hotel, run by Chairman Lee’s eldest daughter. 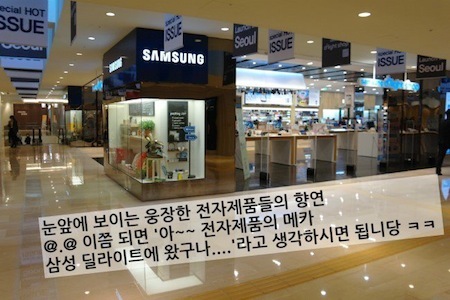 On her way to Samsung Digital City in the suburb of Suwon, she passes Shinsegae’s Jookjeon outlet, where her husband bought his first suit—a pinstripe from the Galaxy label of Cheil Industries: Lee’s second daughter is vice president. Naturally, Jeon and her husband both carry Samsung phones. Regardless, it remains true that South Korea’s chaebol hold an outsized influence on the national economy — around 76.5% of GDP can be attributed to South Korea’s ten largest companies, and their leaders often play a cozy consultative role to Korean policymakers. Incumbent president Lee Myung-bak (이명박), who remains relatively unpopular and tainted with corruption allegations, came to power in 2007 after a three-decade career at Hyundai, including as CEO of Hyundai Engineering and Construction, on a platform of business-friendly policy, not chaebol reform, and his promises of 7% growth from the trickle-down effects of a pro-business government have not come to fruition. Former candidate, software entrepreneur Ahn Cheol-soo, took an even harsher line by promising to break up the conglomerates altogether. 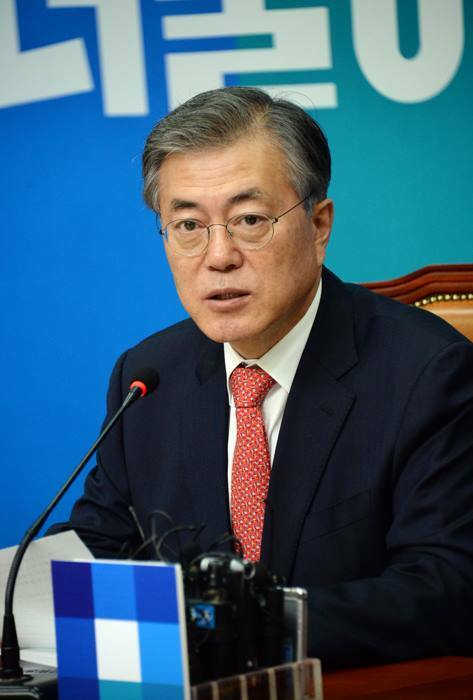 Moon, in particular, has advocated reforming chaebol ownership to reduce the influence of the families that own them, reducing the family influence to that of a typical shareholder or top executive, and unwinding existing cross-shareholdings among the individual companies that comprise each of the chaebol. 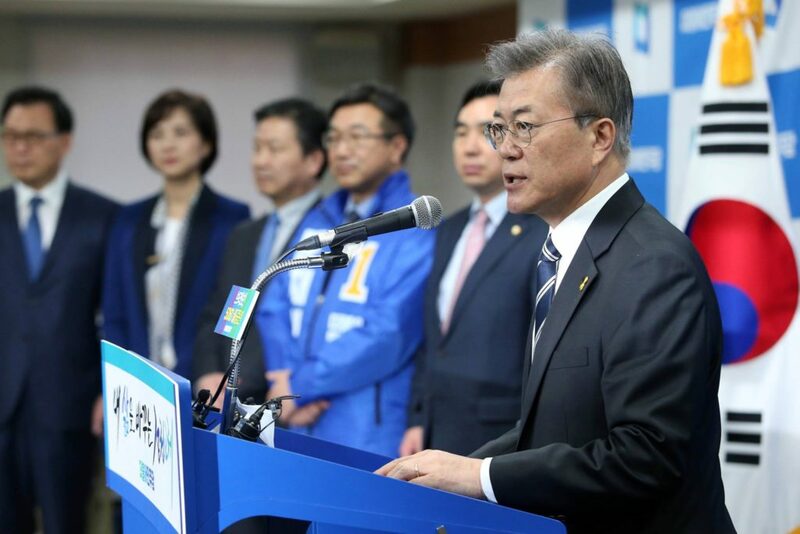 But given that the National Assembly will still be controlled by Park’s Saenuri Party, it remains unclear whether Moon could push such a reform through South Korea’s parliament. For her part, Park has discussed preventing the individual companies within each of the major chaebol from adding to their shareholdings in each other, though she wouldn’t go as far as Moon. Park has also called for strengthening antitrust laws and increasing fines for violations of fair-trade laws. But the surprising aspect of the debate is that South Korea has already taken aim at its chaebol — during and in the aftermath of the 1997 Asian financial crisis, when the chaebol, which already suffered greatly during that crisis after years of mismanagement and bloat, were found to have shoddy accounting practices and to have engaged in bribery and corruption of South Korean government officials. Although the conservative Park Geun-hye has had to fend off challenges tying her to the worst of massively unpopular incumbent Lee Myung-bak and her father, Park Chung-hee (South Korea’s autocratic ruler from 1961 to 1979), it’s another former South Korean president who may represent the largest millstone in the Dec. 19 presidential race. 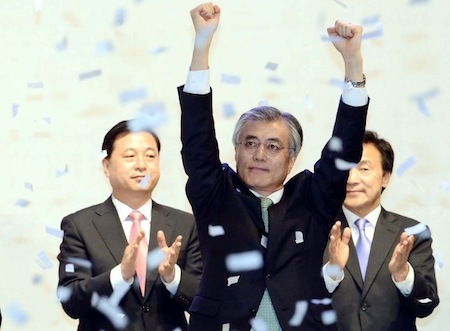 Moon Jae-in, candidate of the Democratic United Party (민주통합당, or the ‘Minju Tonghap-dang’), and a former chief of staff to Roh, has essentially no political identity separate from Roh. He’s inescapably the heir to Roh, for better and for worse — for Roh’s supporters, Moon is an experienced champion of the policies Roh pursued; for Roh’s detractors, of course, Moon represents a return to the perceived incompetence and disappointment with Roh’s administration. Park has had her challenges as the candidate of the Saenuri Party (새누리당 or the ‘Saenuri-dang’), the New Frontier Party — and formerly the Grand National Party — the party to which Lee belongs, but voters don’t associate Park with Lee because Park comes from a different wing of the party, has a vastly different management style and background, and, above all, she has campaigned as much against her opponent, Moon, as she has against Lee. If anything, voters (especially older voters) associate Park’s candidacy with her father, who gained power in a coup in 1961 and pulled South Korea’s economy into the developed world until his assassination in 1979. Voters will recall that Park (the daughter) was essentially South Korea’s first lady from 1974 onwards, when her mother was also assassinated. Despite the economic strides that South Korea made in the Park era, it made precious little progress in the area of political rights or democracy. The campaign for human rights and a more democratic South Korea during the Park years is, in fact, the defining experience of both Roh and Moon — Roh’s emergence in South Korean politics coincided with the rise of the ‘386 Generation,’ a new generation of political leadership educated in the 1960s that came to politics demanding for greater freedoms and democracy. Moon, a human rights lawyer, was actually imprisoned in the 1970s for his activist efforts against the Park regime. Fundamentally, the ties that bound Moon to Roh were forged during that fight — against Park’s father. Park (the daughter) has recently apologized during the campaign for the abuses of her father’s administration, although her father’s legacy probably helps Park among many Koreans nostalgic for what seems to them a golden era of growth and prosperity. That makes this year’s South Korean election — especially with the withdrawal of popular software entrepreneur Ahn Cheol-soo from the race in late November — very much a prototypical ideological fight between the two major forces in South Korean political life for nearly half a century. As such, it’s worth reflecting on Roh’s administration, Moon’s role in Roh’s administration, and the scandal that led to Roh taking his own life by jumping off a cliff in May 2009, which tragically elevated Moon in the public eye. Roh’s suicide came after what many believed were politically motivated allegations of bribery surrounding his family and associates, but those allegations never really touched Moon. 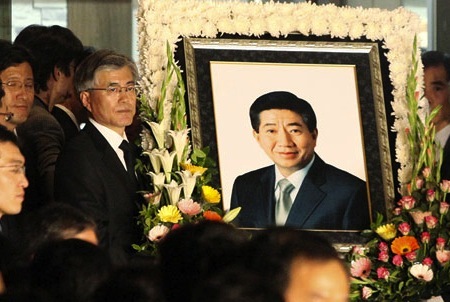 Nonetheless, his suicide elevated the pro-Roh faction within South Korea’s progressive scene, including Moon (shown above at Roh’s funeral), who served as counsel to Roh during the post-presidential investigation and who organized Roh’s funeral. Roh came to office as a bit of an outsider — he served briefly as minister of maritime affairs and fisheries under Kim Dae-jung, hardly the best profile for a 2002 presidential run. But his conciliatory approach to North Korea and his calls for a more equal relationship with the United States, especially following the acquittal of two American soldiers who hit and killed two teenaged Korean girls with an armored vehicle in an accident in June 2002. Roh continued Kim’s ‘Sunshine Policy’ toward North Korea to somewhat less than great effect, and turned out to be more conciliatory to the United States than many expected back in 2002. With so many other economic issues to discuss in the South Korean presidential campaign, relations with North Korea had not always been at the forefront of the campaign debate, even though it was always more likely than not that the unique foreign relations challenge will eventually rise to the forefront of the next South Korean president’s agenda in the next five years. 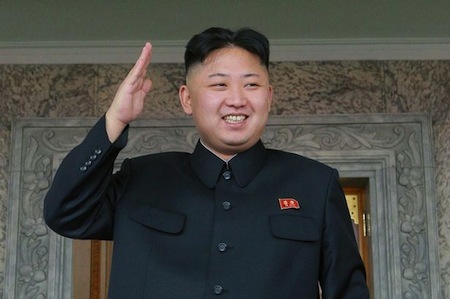 North Korea’s unpredictable passive-aggressive policy with respect to its southern neighbor has continued at a low hum since Kim Jong-un (pictured above) assumed leadership of the ironically named Democratic People’s Republic of Korea following the death of his father, Kim Jong-il, in December 2011. Such developments can influence whom people will support when they go to cast their ballots, although its effects on public sentiments has yet to be determined. “Experts are divided on the impact, with some predicting the launch will give credence to hardliners and help conservative presidential hopeful Park Geun-hye, while others said people may vote for Moon Jae-in of the liberal opposition party because they do not want an escalation of tensions,” an election watcher said. He added that because voters are already split between the conservative and liberal camps, the latest provocation by Pyongyang may not really affect the outcome of the race. “The country as a whole has become ‘indifferent’ having already seen the North test numerous rockets and detonated two nuclear devices,” the expert said. He added that because the launch had been expected people will be less likely to be moved. For now, with a final presidential debate scheduled for Dec. 16, and with new polls forbidden from publication after Thursday under South Korean election law, it will remain unclear what impact the North Korean rocket launch might have on the campaign until election day. Ultimately, however, both major candidates in the South Korean election have promised a more conciliatory policy with North Korea than outgoing South Korean president Lee Myung-bak, and many observers believe the rocket launch had more to do with internal North Korean politics than anything else. While South Korea, with around 50 million people, has a GDP per capita of around $32,000, North Korea’s GDP per capita is something more like $2,400, despite the fact that it has just under 25 million people. 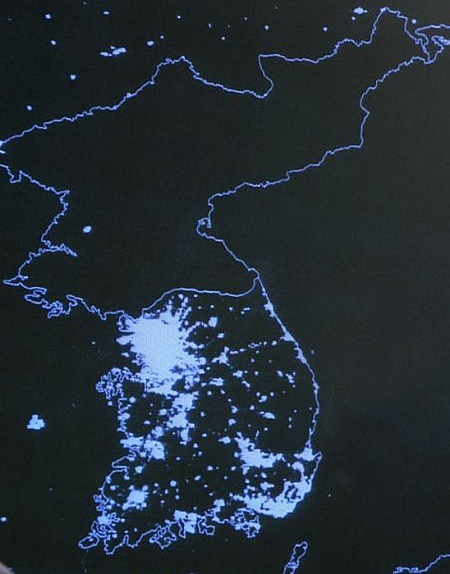 The South Korean economy exceeds $1.15 trillion to just around $45 billion in North Korea (see below a photo of the two Koreas at night from the Earth’s atmosphere). South Korea split from North Korea after World War II, and the Korean War that began in June 1950 when the North invaded the South ultimately became the first proxy battle of the Cold War, pitting active forces from the United States against Communist forces (with the People’s Republic of China backing the North). Despite an armistice agreement in 1953, the two Koreas have formally been in a state of war ever since, and the de-militarized zone between the two marks one of the most heavily armed borders in the world. While it’s expected that the candidate of Lee’s party, Park Geun-hye of the Saenuri Party (새누리당 or the ‘Saenuri-dang’) would take a more hawkish tone, and Roh’s former chief of staff, Moon Jae-in, the presidential candidate of the liberal Democratic United Party (민주통합당, or the ‘Minju Tonghap-dang’) is expected to pursue a renewed variant of the once-ascendant ‘Sunshine Policy,’ the reality may well be more complicated. Park has advocated what she uniquely calls a ‘trustpolitik‘ policy toward North Korea — more hawkish, perhaps, than previous policies of the Roh and Kim administrations, but decidedly more geared toward discussion and conciliation than the Lee administration, which Park says has failed to stem the aggression of North Korea. Given the widespread disillusionment with the Sunshine Policy and its perceived lack of results, in addition to the relatively tighter economic conditions in South Korea, it seems unlikely that Moon would either be willing or able to pursue as wide a conciliatory policy to North Korea as the Roh and Kim administrations. South Korea’s presidential elections never feature incumbents — the president is limited to a single five-year term — but that doesn’t mean incumbents don’t feature prominently in presidential elections. In 2007, Chung Dong-young suffered from his ties to president Roh Moo-hyun, under whose administration Chung served as unification minister, and to some degree, Moon Jae-in, the presidential candidate of the liberal Democratic United Party (민주통합당, or the ‘Minju Tonghap-dang’) and Roh’s former chief of staff. But given that incumbent president Lee Myung-bak, who will leave office as one of South Korea’s most unpopular presidents, garners approval ratings of around 20%, you’d expect that the candidate of Lee’s Saenuri Party (새누리당 or the ‘Saenuri-dang’), formerly the Grand National Party, would be suffering even more, right? Wrong. In South Korea’s presidential race this year, one of the reasons that Park Geun-hye has consistently held a lead over Moon has been her successful distancing from the Lee administration (although that lead is narrowing fast, especially after Park made a gaffe in the second presidential debate Monday indicating she wanted to ‘invigorate’ the underground economy). If anything, Park has been more successful by hammering away at lingering doubt about the Roh administration and Moon’s ties to it as Roh’s chief of staff. “The Roh Moo-hyun government wasted a period of prosperity in the world economy by indulging in ideological debates and power struggles, leading to the erosion in working-class living standards. 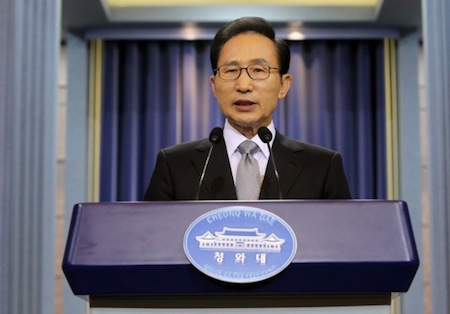 The Lee Myung-bak government put growth before everything and failed to make lives better. I will not be a leader who will repeat the mistakes of previous governments,” Park said at a rally in Seogwipo, Jeju Island. During the campaign, Park has attacked Lee’s administration for having failed middle class people and for exacerbating income inequality — an issue that both Park and Moon had pledged to make a top priority if elected. Despite the rhetoric, there’s really no indication that Park’s administration would mark a vast policy difference from Lee’s administration. If anything, Korean conservatives are incredibly united behind Park’s candidacy — more so than at any other time since the 1987 election. 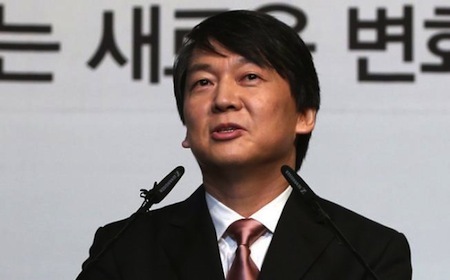 Last Friday, independent presidential candidate Ahn Cheol-soo dropped out of the South Korean presidential race. Without a doubt, his decision has transformed the race from a three-way contest between one conservative and two liberals, which was destined to favor the conservative candidate, Park Geen-hye of the Saenuri Party (새누리당 or the ‘Saenuri-dang’) into a direct showdown between the two dominant brands of politics in South Korea over the past half-century. 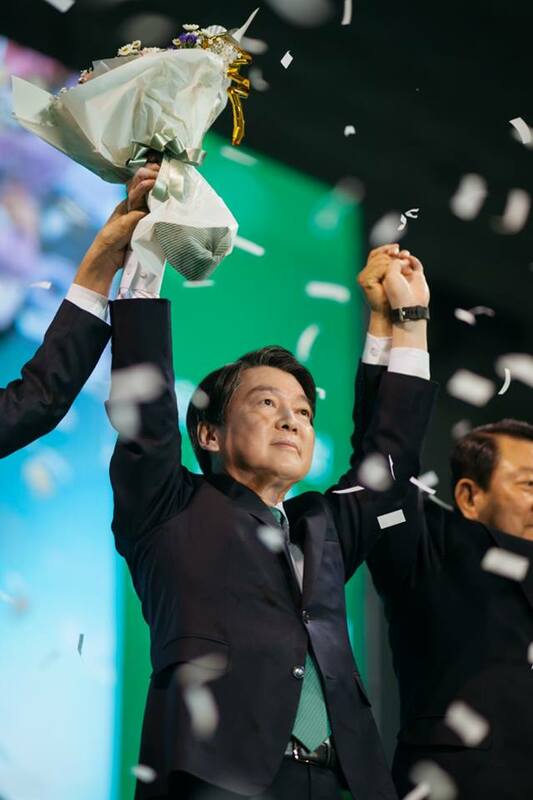 Before his withdrawal, Ahn was splitting the support of liberal voters with Moon Jae-in of the Democratic United Party (민주통합당, or the ‘Minju Tonghap-dang’). Now Moon and Park are in a much closer race, although the latest polls give Park a slight edge (the latest Realmeter poll from Nov. 30 shows Park with 49.9% support and Moon with just 44.2%). Polls routinely showed that before his withdrawal, Ahn, if anything, was the stronger candidate against Park (not Moon). It’s still unclear why Ahn dropped out so suddenly — in an interview last week prior to his withdrawal, he indicated he had no intentions of bowing out. But by falling on his own sword, Ahn has made himself even more popular by apparently putting the cause of defeating Park ahead of his own personal ambitions. Now in the position of a potential kingmaker, Ahn can trade his vigorous support for Moon (Ahn has already somewhat gracefully called on his supporters to vote for Moon) for a role in a potential Moon administration, which could give Ahn governmental experience in advance of the 2017 election. For such a liberal candidate, it’s a little shocking to see polls that show only 50.7% of Ahn’s former backers are committed to Moon with less than three weeks to go until the election, even though over 70% of Ahn’s supporters want to see a change in administration from the current Saenuri Party. Fully 26.4% of Ahn backers apparently support Park and 21.9% remain undecided — Moon cannot win unless he (with or without Ahn’s help) can migrate more of Ahn’s former supporters into his own camp. 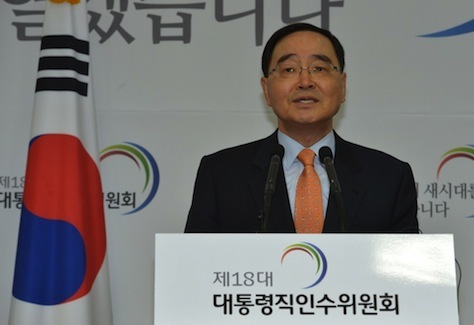 Ahn’s popularity has been somewhat of a phenomenon in South Korea since he first flirted with running in Seoul’s mayoral race in October 2011 — although he failed to enter that race, which polls showed he could have won, he backed Park Won-soon, another liberal independent, who ultimately won the Seoul election. 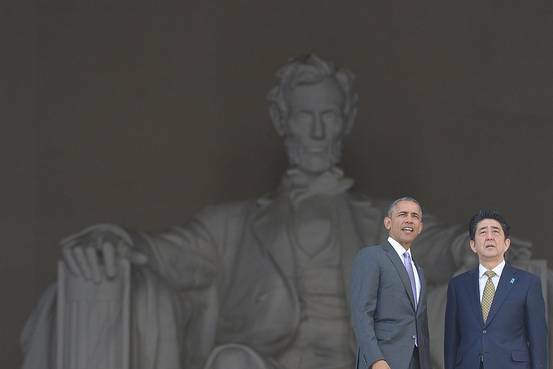 Ahn spent the better part of 2012 teasing a presidential campaign that he announced only in September of this year. Those words come in relation to the legacy of Park’s father, Park Chung-hee, who took power in a coup in 1961 and held power until his assassination in 1979. Park Chung-hee is credited with lifting South Korea out of poverty in the wake of the Korean War and transforming the South Korean economy into one of the most efficient and developed in Asia. The South Korean economy is today one of the world’s most productive and developed, and it’s certain that Park Chung-hee’s administration deserves credit for that. But his legacy remains tarnished by authoritarian rule that did not tolerate free speech or dissent of any kind. His regime engaged in political arrests and torture, and his rule morphed into a dictatorship despite promises of making South Korea more democratic. South Koreans, to this day, have incredibly mixed feelings about Park Chung-hee. As such, the legacy of Park Chung-hee is invariably at the heart of his daughter’s campaign — when Park Guen-hye’s mother was assassinated in 1974, Park Guen-hye essentially took on the role of first lady in lieu of her late mother. Indeed, much of her success comes from a sense of nostalgia among those who see the 1960s and 1970s as a time of unparalleled growth for South Korea. There’s no question of South Korea turning back from democracy, which has been entrenched in South Korea since the 1980s, but there is a sense that South Korean voters have wanted Park Guen-hye to acknowledge and transcend the darker aspects of Park Chung-hee’s legacy. “I’m sure all of you know how difficult it is in this country for a child to judge his or her parents, and especially to make a public statement about their misdeeds. I do not think that the people of Korea really want me, a daughter, to spit on her father’s grave,” she said. Moon Jae-in (pictured above, top), a former chief of staff to president Roh Moo-hyun, won the presidential nomination on Sunday of the main opposition party in South Korea, the Democratic United Party (민주통합당, or the ‘Minju Tonghap-dang’), and today, Ahn Cheol-soo (pictured above, below), a popular doctor-turned-entrepreneur launched an independent bid for the presidency. Both are, somewhat, novices to electoral politics in South Korea. Moon is the former chief of staff to the late former president, Roh Moo-hyun, and Ahn is a complete outsider to South Korean politics. 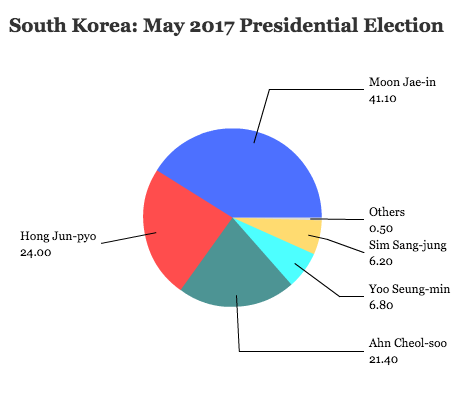 Both pull support from the same pool of generally liberal and moderate voters — meaning that if neither drops out before the December 19 election, neither currently would stand much of a chance against the frontrunner, Park Geun-hye of the Saenuri Party (새누리당 or the ‘Saenuri-dang’ / New Frontier Party). The essential fact of the South Korean presidential race is that if neither Moon nor Ahn steps down in favor of the other, Park will win the election. Every poll, including the latest one from Real Meter, conducted Sept. 17-18, demonstrates this glaring threshold truth: Park leads with around 39%, Moon follows with 26% and Ahn wins 22.5%. Although over the course of the month, Moon has moved from 15% and third place (drawing support from both Park and Ahn) into a stronger second place, arithmetic is arithmetic. Moon and Ahn may seesaw as the favorite challenger to Park, but Moon, having easily won DUP’s primary, now faces another sort of primary — with Ahn — to consolidate the liberal and moderate vote. Furthermore, even if one candidate bows out soon enough to allow for a unified challenge to Park, the road that either Moon or Ahn faces ahead is tricky. Even in a one-on-one race with Park remains competitive against either Moon or Ahn. So the longer it takes for either Moon or Ahn to back down as the chief alternative to Park means that the race will focus less on Park and more on the Moon vs. Ahn aspect.